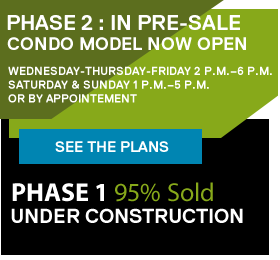 U-CONDOS is very proud to offer a second condominium project of 31 residential units with numerous options, including condos of one, two, three, or four spacious chambers ranging from 586 to 1508 square feet. This project of four floors includes a penthouse floor at the top level, complete with mezzanine and private roof terrace. Indoor parking, a communal terrace, balconies, elevator and private storage spaces will also be available. The U-CONDOS project is ideally situated close to the heart of Little Italy, the Jean-Talon market, Jarry park, many shops, gourmet cafes, restaurants, and the trendy Mile End district. Getting around has never been so simple. In minutes, you have access to the De Castelnau metro station, the city bus and train networks, Communauto stations as well as the celebrated Bixi. U-CONDOS offers affordable luxury condos in one of Montreal’s most sought-after neighbourhoods. A presto!